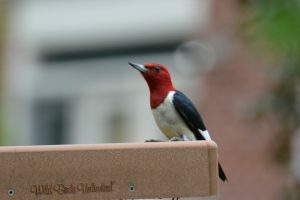 “There was a Red-headed Woodpecker in my yard”, my brother tells me. Then after I ask him a few questions about the bird I find out that it really is a Red-bellied Woodpecker. He does not know much about birds so I had to ask. The reason being is because many people incorrectly identify the Red-bellied for a Red-headed Woodpecker. 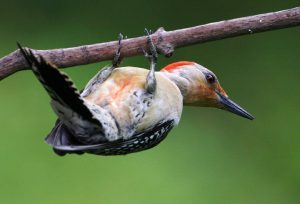 Of course it doesn’t help that you really can’t see much of a red belly on the Red-bellied Woodpecker. It is more of a faded red color even more like a blush, not near as bright red as its head, so it makes more sense to call it a Red-headed. Doesn’t it? 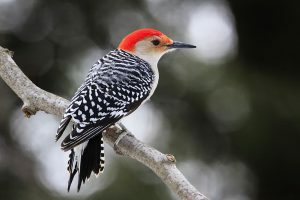 The Red-bellied Woodpecker is a common woodpecker that can be found on the eastern half of the United States as far south as Texas and as far north as Canada. Its habitat is woodlands, forest edges, suburban backyards, parks, and orchards. 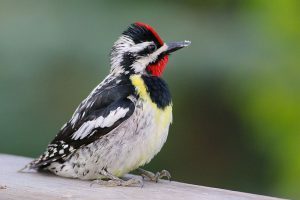 This bird is a medium size woodpecker and is from nine to ten and a half inches in length. Their wingspan is from fifteen to eighteen inches. Males (top photo) have a bright red coloring on the crown of their head and extending down the back of their neck or nape. Females (photo right) have a gray crown with red only going down the nape of the neck. Both have faded red coloring just above the beak and on their bellies. Their wings have bold black and white stripes. Red-bellied Woodpeckers are year round residents throughout their range however some of the northern birds may migrate a little more southward during the winter do to lack of food. Their diet consists of insects, acorns, other types of nuts, berries, fruit, seeds, and will also eat sap from trees, mice, nestlings (baby birds). They like to hide their food in cracks and crevices of tree bark to be able to eat later. Red-bellies nest in mature trees, old stumps, and decayed cavities. They drill holes in these to excavate their nest cavities which can be eight to twelve inches deep. Both male and female participate in the excavation of the nest. 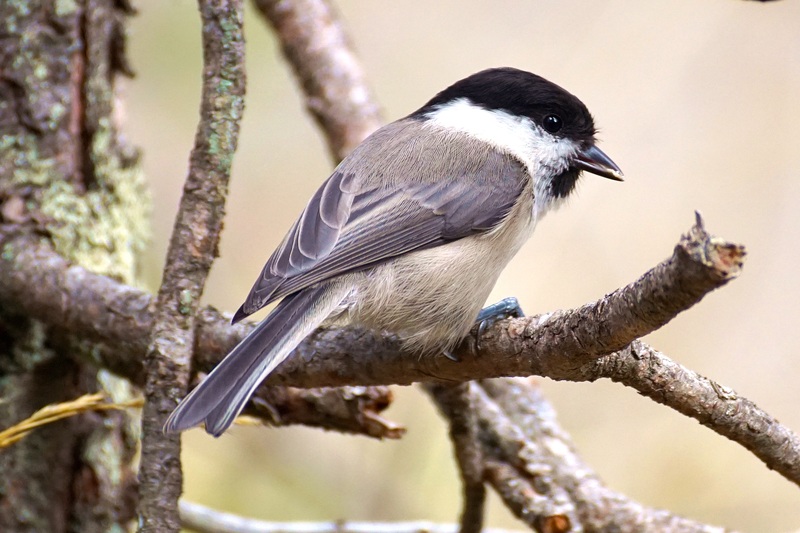 Breeding takes place in early spring when you will hear the male making its drumming sound on a tree trunk, branch, or even your wood siding or gutters. The louder their sound the more attractive it is to a female. The female Red-bellied lays up to five eggs with incubation by both the male and female. Incubation may take up to twelve days. Nestlings (baby birds) are fed by both parents for up to four weeks until they fledge the nest. Then parents will continue to raise the young for up to six or more weeks afterwards. 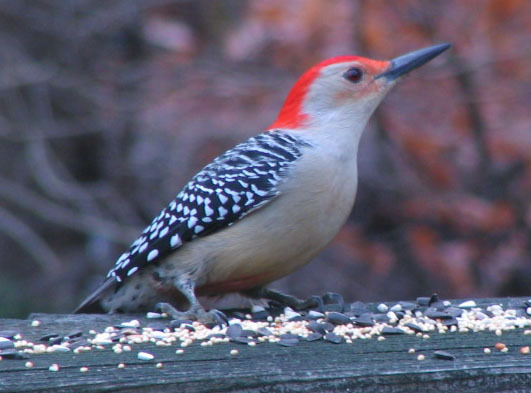 Red-bellied Woodpeckers can be a regular visitor to your backyard feeders if you provide them with sunflower seed, fruit, or nuts. I use a premium bird seed mix that includes all of these that works very well not just for the Red-bellied Woodpecker but for many other backyard birds. Red-bellies will also come in to suet feeders. 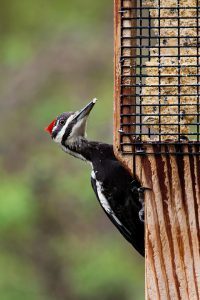 For suet you can either purchase the packages that say woodpecker mix or look for one with fruit and/or nuts in it. You can feed woodpeckers not only in winter but also all summer long if you look for the summer varieties at your local bird feed store. If you want to make your own suet you can use peanut butter mixed with sunflower seeds which is a favorite of most woodpeckers, but just remember that this mix is best in colder temperatures as it can melt easily in hotter temperatures. The Red-bellied will also eat cracked corn but I do not like to offer it because it attracts a lot of the blackbirds and squirrels. However, that is up to you and what your preferences are. This woodpecker will come to platform feeders, suet feeders, tube feeders, window feeders, fruit feeders, and hopper feeders. I have even seen them come to my hummingbird feeder to drink the nectar in summer. Red-headed Woodpecker – this bird has a striking red head, neck, and top of breast with bold black feathers with white on them. The breast is also a bold white. They are not as common as the Red-breasted but seem to be picking up in numbers. They feed on insects, seeds, nuts, fruit, berries, and sometimes bird eggs and baby birds. Pileated Woodpecker – one of the biggest woodpeckers with a flaming red crest and black and bold white stripes down the neck. The body is mostly black. Many people call it Woody Woodpecker as it looks like the animated bird. Pileateds are about sixteen to nineteen inches in length. You can spot them on dead trees or fallen logs feeding on their favorite…carpenter ants. They will come in to your suet feeder for seed and nuts (juveniles mostly) especially in winter but I have had them in summer time too. 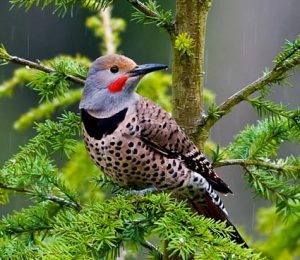 Northern Flicker – can be found mostly at the base of trees feeding on mostly ants but also termites, beetles, and caterpillars. In winter they eat fruits and berries and will come in to your suet feeders. 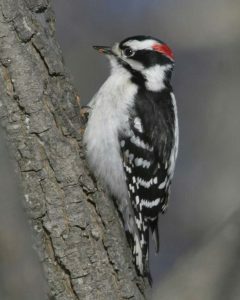 Hairy Woodpecker – is about the size of a robin with black and white stripes and red on its head. It feeds on insects mostly but will also eat seeds and berries and will come in to your suet feeder. Downy Woodpecker – the Downy is pretty much a smaller version of the Hairy Woodpecker with a shorter beak, and can be a permanent resident at your backyard feeders. It eats insects, seeds, berries, and suet. Yellow-bellied Sapsucker – they eat sap from trees, insects, berries, and fruit. You can find these in woodlands, groves, and orchards. You can identify this sapsucker with yellow along its black breast. 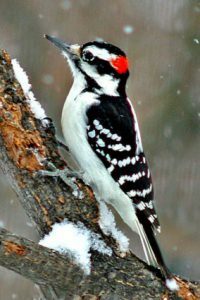 We usually see this woodpecker in the winter months in Kentucky. 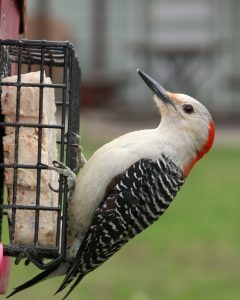 It is not too difficult attracting Red-bellied Woodpeckers to your backyard feeders. Their favorite food is insects but they will come in to eat your sunflower seed, nuts, berries, suet, and fruit. I have this woodpecker year round in Kentucky as it does not migrate here. It is a year round resident in most areas with the exception of the colder climates on the eastern half of the United States. Just don’t mistake this beautiful woodpecker for the Red-headed Woodpecker which is also a very striking bird. Yes, the Red-bellied has a bright red crown and nape but it does not have an entirely red head like the Red-headed. There is a big difference in the two. Either way, you can’t go wrong in having one or the other or even both in your backyard ;-). Posted in Backyard Birds, Bird Feeders, Woodpeckers and tagged red bellied woodpecker, woodpeckers.